In 2013, after our church renovations were completed, we commissioned Mae Runions, http://maerunionsart.com/ a local Vancouver liturgical artist, to create two banners for our sanctuary. After several meetings with Mae, our art committee agreed on two fabulous designs. The results of Mae’s work are stunning. 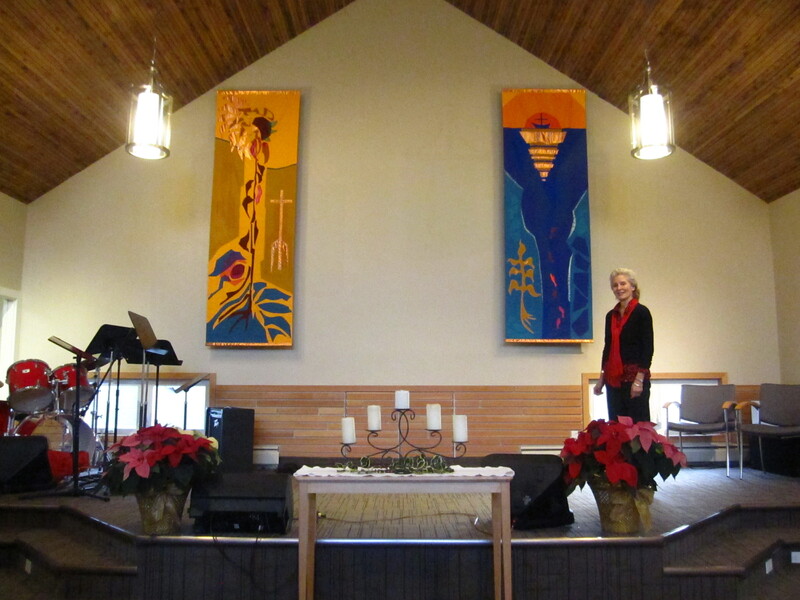 In March 2014, the banners were installed and a service to bless the banners was held. The banner on the left, “The Church in the Garden,” reflects our desire to grow in our understanding of God’s kingdom and in the fruits of the Spirit. The Scripture text for the hanging is taken from Galatians 5: 22-23. The banner on the right, “The Tree and the River,” reflects our interest in the abundance of God. Several scripture references speak to this beautiful relationship of the tree and the river: Psalm 1:3; Ez 31: 7; Rev 22: 1, 2; Ez 47: 6, 7, 12; Jer 17: 7, 8; Ps 104: 14-18.